My oldest daughter turned six over the weekend. How did that happen? In some ways things haven't changed very much. She was a spitfire as a baby and she's grown into a very dramatic child, often costumed and also often getting into trouble for punching a sibling who angers her. She can almost simultaneously be the most lovely and delightful child, helping cook in the kitchen, telling me about a story she's read or caring for a sibling and also the most annoying, aggravating kid. I find myself completely baffled by her sometimes and at other times I think she may be the most like me. Maybe that's why she baffles me. 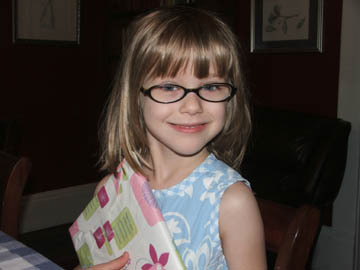 She certainly looks the most like me, although as much as I wanted glasses as a kid, I never got them. For her they have made a world of difference. Before she got them, she never drew anything, her ability to read went backwards and we were both frustrated. After glasses, a whole new world opened up. Now I have a hard time prying her away from books, she draws lovely pictures and she's writing as well as most of the other first graders I know. Even though she still has the, ahem, lively personality she's always had and a sometimes interesting perspective on the truth (her first famous bout of trying to blame someone else for her misdeeds came before age 2, when she claimed the dog had taken a bite out of each apple), I marvel at the chance to be around someone so fascinating. Whatever she does that may at times drive me completely insane, and my husband can attest to the fact that more than anyone else she does make me crazy, she's also the child which when I think about I just have to say, "Wow! What a kid." I worry more about her and pray more about her. If she just uses her powers for good, the bad guys better watch out! Six! I can't believe it. Hope she had a fabulous day. My four y.o. has a "lively" personality as well - higher highs and lower lows. I wouldn't trade her for anything, though her hard-headedness can be a challenge. I continue to pray for God to bless me with a good memory of her and the other kidlets so I'll have something to enjoy in about fifteen years. I know I won't have the strength to chase after grandkids! Me: P, who took a bite out of every apple in the bowl you knocked off the table and broke this morning? Did you do it? P: No. Me: Did your brother do it? P: (giggling) No. Me: Did the dog do it?!?! P: "HOBBES nibbow appow!" Hobbes nibbled the apples, indeed. She is so fun.